North Korea yesterday detonated a miniaturised nuclear explosive in a test which it is claiming was a success and the U.N. is condemning as a "grave violation of U.N. resolutions". 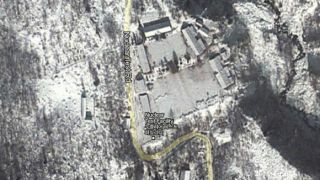 The test was conducted in a secret testing facility, but with thanks to information gathered from North Korean dissidents and defectors, you can take a look at the test facility now on Google Maps. And wouldn't you know it, the test apparently took place in a large facility with the street address 1 Nuclear Test Rd. According to Mashable, pin-pointing the address came with the help of the United States Geological Survey's (USGS) Earthquake Hazard Program, which reported seismic activity in North Korea yesterday, with shockwaves measuring a magnitude of 5.1. Plugging the co-ordinates of the subterranean rumblings (41.307°N, 129.076°E) into Google Maps takes you to Nuclear Test Rd, and to the facility after a little zooming and panning. If after checking out the nuclear facility you feel like scoping out a few more places of interest on Google Maps, you can try actor Will Smith's home (which looks like a small village), or try and solve the mystery behind this huge question mark painted on the ground in France.